Thursday night at its 86th Annual Awards Gala, the Art Directors Club awarded Goodby, Silverstein & Partners its Hybrid Gold for the agency's work on the CaliforniaFfluid Milk Processing "Milk Aliens" campaign. The ADC's Hybrid category awards integrated visual communications workwhich "transcends conventional uses of media." Extending its 'Got Milk?' 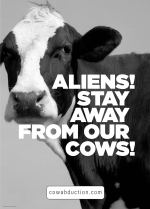 work, the agency created a fictional world in which California cows were being abducted by aliens and taken to a distance planet, whose residents were in dire need of their "white wonder tonic." We think the work is deserving of this notoriety.